The Baroque wooden synagogues, with high, staged roofs, which stood in small towns did not survive, either. 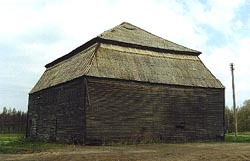 The volume of these synagogues and their exterior forms had similarities with several types of buildings of Lithuanian folk architecture: manors, barns, granaries. The facades of these synagogues were vivified by open galleries or balconies, supported by columns. Low annexes were sometimes crowned with pyramid-shaped apexes imitating small towers. The carved edgings of windows, cornices, planking of doors ( ) Lithuanian folk literature. Especially impressive were synagogues in Vilkavishkis, Jurbarkas, Shaukenai, Valkininkai. 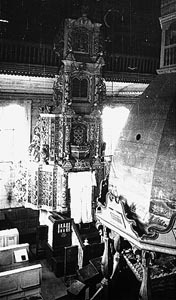 In Baroque synagogues the bima stood in the middle of men's hall or in the center among the columns. It was a construction of light, reticulate forms, similar to a pavilion, canopy or small chapel. The forms of Aron-Kodesh often resembled the Catholic altar - several tapered periods. The details of the decor of Aron-Kodesh were characteristic to Jewish art symbols, flora and fauna motives, the Ten Commandments, the crown. The volume of Baroque stone synagogues is more compact, interior forms simple, with very few elements of décor. 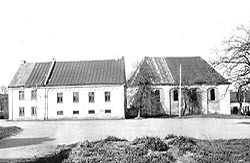 The buildings of two Baroque stone synagogues in Kedainiai and Kalvarija survived till our days. The oldest wooden synagogues in Lithuania that survived till our days were built in the age of Classicism. Their volume is more integral and their forms simpler than those of Baroque wooden ones. 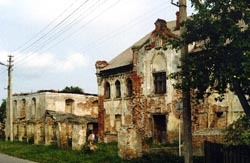 The volume of a Classical synagogue in Pakruojis remained unchanged, however, its windows are boarded up, and the interior completely destroyed. The bima was octagonal, constructed under the principle of an open "bower". Synagogues in Tirkshliai and Seda (later rebuilt) were most probably built in the epoch of Classicism. 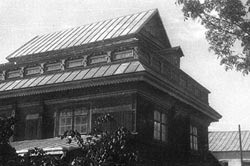 The building of an old wooden synagogue, built either in the age of Classicism or Romanticism, still stands in Zhiezhmariai. Quite a few stone synagogues were constructed in the age of Romanticism (1830-1860). Now one of them stands in Kaunas, on Zamenhof street, another - in Krekenava.